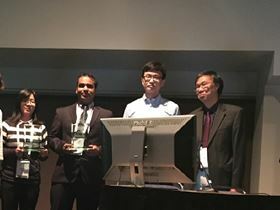 The winners of the 2015 Biomaterials Outstanding Paper Award at the World Biomaterials Congress 2016 (left to right: Chieh-Cheng Huang, Prof. Ankur Singh for Alberto Purwada, Charlie Ren for Bernhard Jank). Last year in May at the World Biomaterials Congress 2016 the editors of Biomaterials had the pleasure to present the very first 2015 Biomaterials Outstanding Paper Awards to three winning articles authored by Alberto Purwada (Cornell,USA), Chieh-Cheng Huang and Hao-Ji Wei (co-first authors, National Tsing-Hua University, Taiwan) and Bernhard Jank (Massachusetts General Hospital/HMS, USA).. These awards recognized researchers who have made outstanding contributions to the field of biomaterials with their publication in Biomaterials during the calendar year 2015. On behalf of the journal Editor-in-Chief Prof. Kam Leong and his editorial team, we are now calling for nominations to the 2016 Biomaterials Outstanding Paper Award. Nominations from leaders in the field as well as self-nominations are welcome. The article should have a publication date of 2016 with Biomaterials. Please submit the . The nominator or corresponding author is asked to describe the significance of the article including its novelty and impact on the field (max. 100 words). The Biomaterials Outstanding Paper Award aims to recognize outstanding research in biomaterials that blazes new trails and advances biomedical science and engineering. It consists of a USD 1000 prize to the first author of the manuscript. Prof. Leong will announce the 2016 Biomaterials Outstanding Paper Award at the upcoming European Society for Biomaterials 2017 meeting in Athens, Greece. Chieh-Cheng Huang & Hao-Ji Wie et al. To learn more about journal Biomaterials and its performance please visit our Journal Insights. To submit your article, to consult our Guide for Authors or to meet our editorial team and international board visit the Journal homepage. Biomaterials is invested on recognizing and supporting its reviewers. To Volunteer to Review for the journal please register here. To learn more about the editors’ perspective on reviewing watch on demand our Publishing Campus Webinar presented by editors Prof. Pandit and Prof. Yu.